Keep it classy while letting the room know that you are here for the party in this New Year's Eve 2015 tuxedo shirt from the Kings of Leon. The graphic includes a black-and-white faded classic tuxedo print with black bow tie against a striking red, white and blue Kings of Leon faux lapel button. The shirt has an intentional and edgy faded vintage style in order to give it a unique and relaxed appearance. 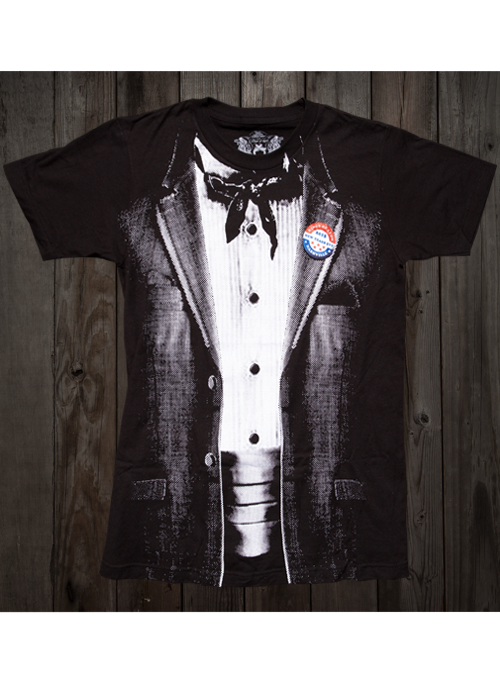 These black tuxedo tees are available from RockAndRollTShirts.com and are perfect for daily wear or to spice up an outfit for a special event.